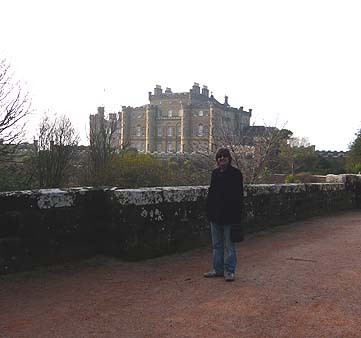 If you would like to see pictures of Ian at the locations in 2002, please scroll to the bottom of the page. 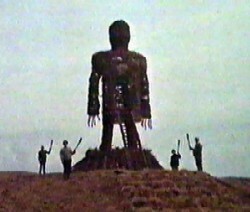 Not a lot of people know this, but Ian was in a cult film in 1972 called the "Wicker Man ". 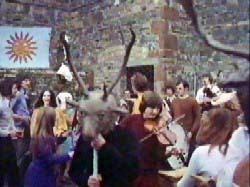 The film is a haunting and sinister tale of Pagan Ritual and has stood the test of time as being a classic that will just not go away !! As Dougie likes to describe it " A film that you won't get in the bargain bins in Woolworth's , it is always full price ! " 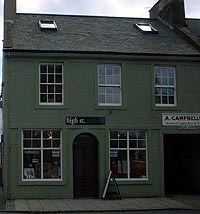 It starred Edward Woodward, Christopher Lee and Britt Ekland and was set in the Scottish Island of " Summerisle ". He was the tender age of 19 years and this was his first professional job . He had just started work in a stockbrokers in London as a clerk and was beginning his non-musical career. Of course he was still playing at that time but only in the evenings. and asked Bernie, Andy and Ian to join him. He can remember being picked up from Glasgow Airport and taken in a Daimler limousine to the location. By this time he was excited beyond belief and definately a little nervous. 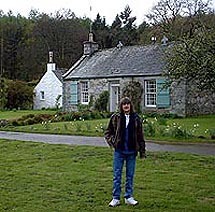 He arrived in Scotland to find it very cold , as although the film looks like it was shot in Summer , it was actually October when they were all there. So there he is , with the rich and famous !! That close to Britt eh!!! Mind you not as close as Gary who as you can read in his site was much closer! Of the main members of the cast and crew he can remember Edward Woodward being a generous and charming man. Christopher Lee being very tall and striking and speaking exactly as he does in the film. He has a little anecdote on this matter actually. He and Gary were tramping up to Lochinch Castle to do the sword scene and they were passed by Anthony in this "wonderful" car. He stopped and offered them a lift. Ian was beside himself. He settled back and day-dreamed all the way on what it would be like to own one of these ! 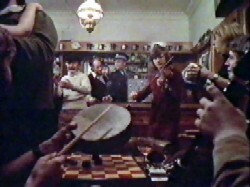 In the first scene you can see Gary Carpenter and Andy Tompkins playing along with Ian in the "Green Man" where Sgt Howie stays on "Summerisle"
In the second this is the infamous "Landlord's Daughter" scene which sees Britt "strutting her stuff" without the aid of a body double this time. 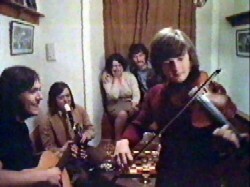 You can also see the bodhran being played artfully by Bernie Murray and the concertina played by Mike Cole. 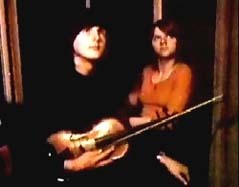 In this little montage you can see Ian in the " Gently Johnny " scene , gazing wonderingly at the ceiling as "Willow" (alias Britt ) was deflowering the young Ash Buchanan. 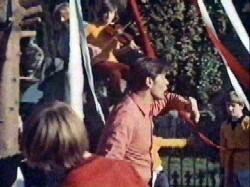 The second is the "Maypole" scene where Ian sits on the wall whilst the young boys of the Parish weave their magic with the Maypole. This is the aforesaid wall! 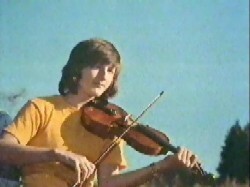 He actually gets to play a little solo here and thankfully no longer has that T-Shirt. In the second picture ( if you can pick him out!) 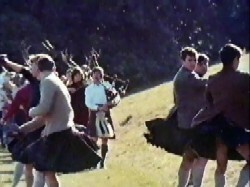 Ian is playing in the procession , there is a definite "Ooh er missus" moment with those kilts don't you think ? 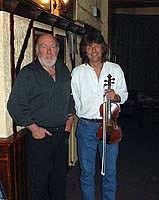 Unfortunately , at this point Ian had to go back to London for a gig with the "Chingford Ceilidh Band". So he was missing for the final scenes and the "Wicker Man" finale. 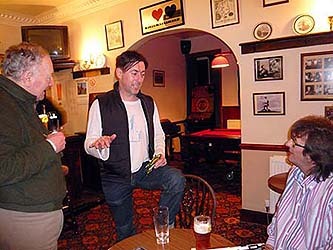 The film has been badly cut over the years ( For more read Allan Brown's "Inside the Wicker Man") and Ian remembers doing scenes that have never appeared in any version of the film. One such scene is the "Dream" sequence which Ian can remember parts of quite clearly. He believes that this was filmed when Sgt Howie is sleeping,whilst the Hand of Glory burns. During the dream , which is a Kaleidoscope of images, a huge egg shaped stone is revolving faster and faster.Also the woman in the churchyard who is feeding the baby has the egg in her hand and crushes it. All very symbolic stuff! This scene has never been mentioned anywhere to my knowledge. Has anyone out there ever heard of it ? If this page has been a complete mystery to you, then go get the film , it will all become clear !! It is a masterpiece in the true sense and is an eerie tale full of Pagan menace and suspense. It's history has been chequered to say the least , it has been burnt, cut and the pieces allegedly buried under the M3 of all places. It was originally billed as an "A" feature (remember them ?) only to be eventually released as a "B" with "Don't Look Now". The catalogue of disasters goes on and on. However the film carries on in it's popularity ( check out some of the hundred's of sites on the internet ). Personally I find it one of the only films I can watch over and over again. I first saw it when I was about 18 on the BBC and have been hooked ever since. Thanks to the legendary Pete Learmouth for all his help with the content of this page. 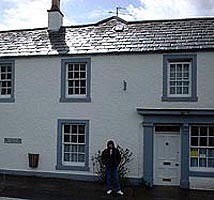 As promised her are the pictures of Ian in Dumfries and Galloway 2002. 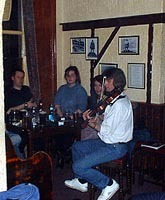 The first picture is of Ian playing at the Ellangowan Hotel (the inside of the Green Man) with David and Anna from Northampton and Gail Ashurst who writes Nuada. 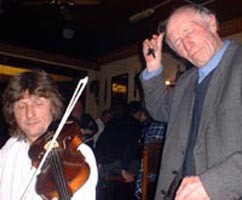 The second is Ian playing with the resident spoons player, Jimmy. 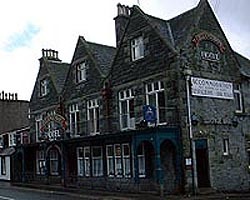 Ian and Bill Christie, the landlord of the Ellangowan Hotel and secondly the exterior of this lovely place , well worth a visit. See our Links page for details. 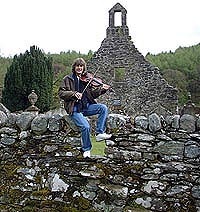 On the wall where he played the Maypole scene and in front of the school house at Anwoth. 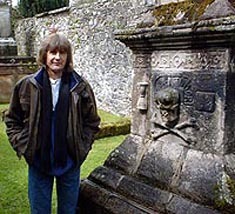 Beside that now famous gravestone and May Morrison's Post Office in Kircudbright. 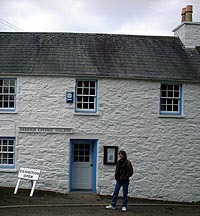 The alleyway used for the chase scene and the bakery (Exterior) in Kircudbright. Finally the exterior of the Green Man at Gatehouse of Fleet. 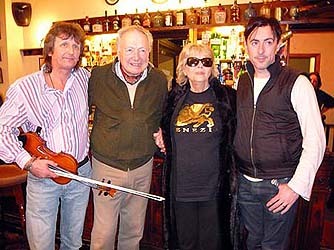 Ian has been back to Scotland in March 2009 to take part in a programme on Scottish Film for the BBC where he got to meet up again with Robin Hardy and Ingrid Pitt.